When it comes to jewelry, I've never been obsessed. I don't what it was, but accessorizing was never important to me. Whenever I did shop for jewelry, it was always something simple like little studs, really minimal necklaces, etc. 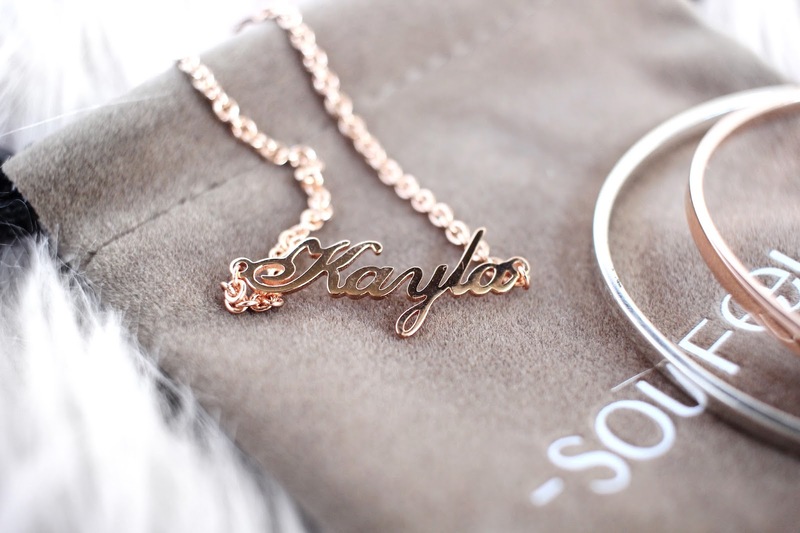 However, one thing that hits my soft spot is personalized jewelry. I remember a year or two into my boyfriend and I's relationship, he gave me a necklace with my name on it. I loved it and wore it every single day until it unfortunately broke *sad*. Another year, he got me a Pandora charm bracelet and he would get me different charms for it on occasions. This isn't really personalized, but in a way it is because each charm he picked out for me had a meaning behind it. With that said, both pieces were very close to my heart. Fast forwarding to the now, I was so ecstatic when I found out that Soufeel wanted to work with me. 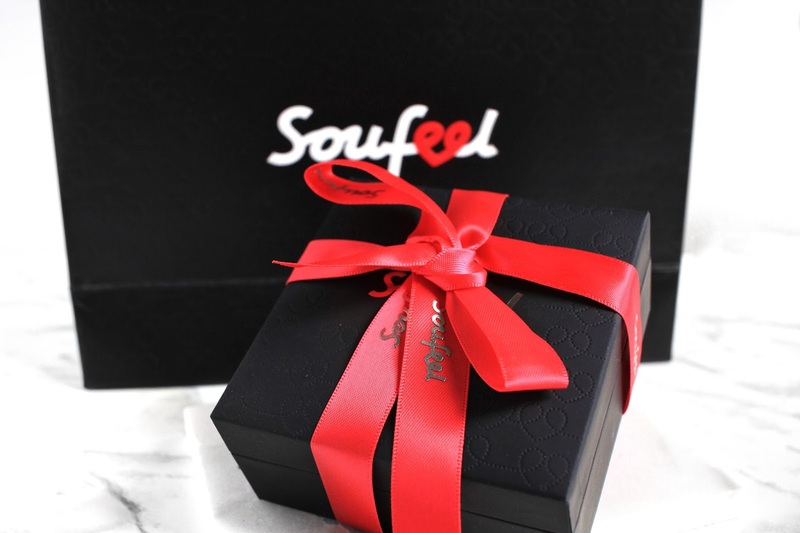 Soufeel is an online store that sells jewelry, including charm bracelets, bracelets, necklaces, earrings, and ring. A majority of their pieces are customizable (yay!). 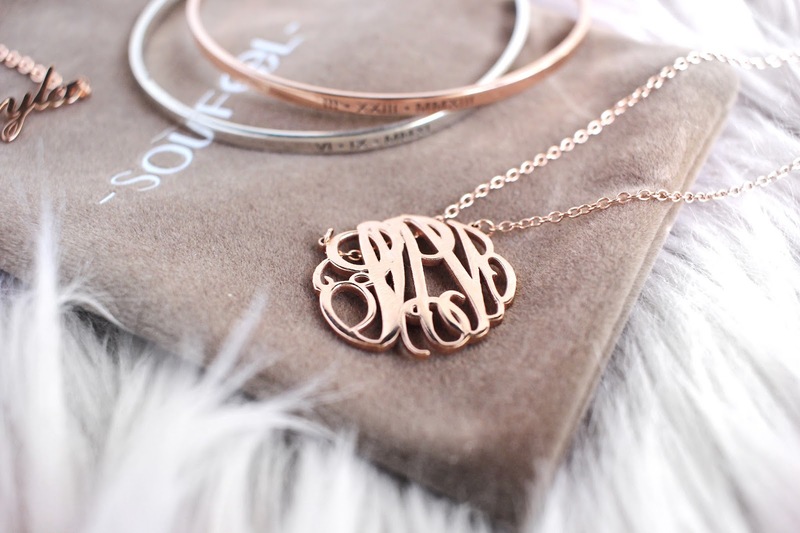 When it comes to personalizing your jewelry, they offer engraving, monogram, name plates, and photos. I was so overwhelmed with what to choose as they offer so many great pieces, so I spent quite a few hours on the site...oops. One thing I really appreciate about the website is that when you're personalizing something, they show you a preview of how it'll turn out and decide if you like it or not. 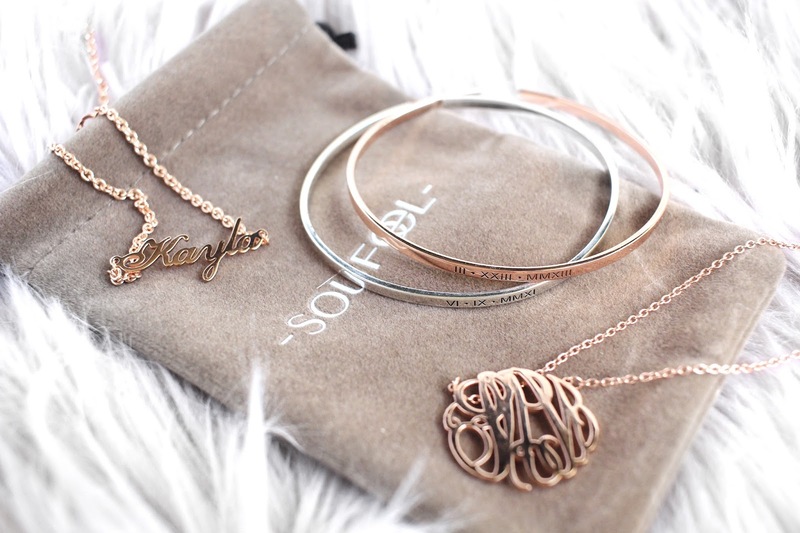 For a while, I've wanted a monogram necklace and when I found out that Soufeel made them, it was the first thing to be added to my cart. Under their monogram category, they have a variety to choose from that differ in colour, size, font, and design. I decided to go for the rose gold one. I couldn't be anymore happy with the outcome as the pendant has a decent weight to it and doesn't feel at all cheap. The hook is sturdy and the chain has multiple loops so that you have the choice if you want to wear it longer or shorter. Overall, this has to be my favourite out of the bunch. I've been wearing it non-stop..seriously, I wear it every single day. The next two things I picked up were engraved bracelets. For a moment, I hesitated and thought hard about what I wanted engraved on them, but then the perfect idea hit me. There are two dates that are close to my heart, so I decided to engrave them on each bracelet. 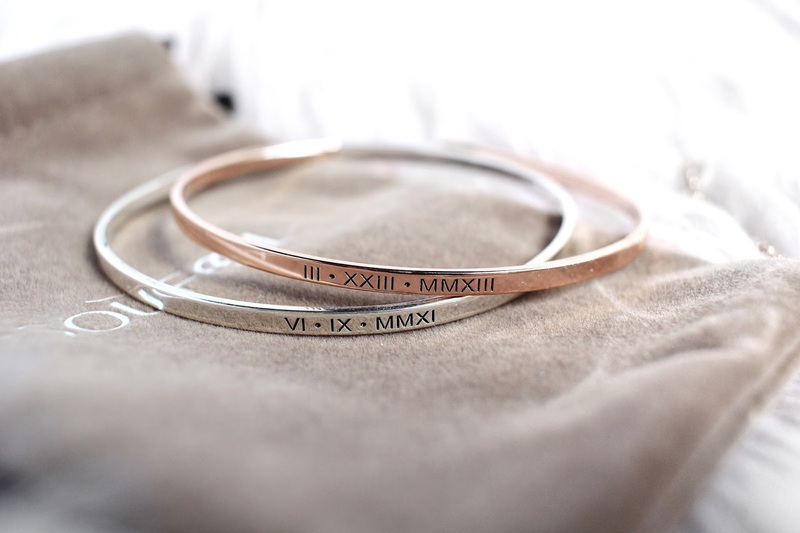 On the Silver Bangle, I engraved the date my boyfriend and I got together, in roman numerals. On the Rose Gold Bangle is the date of my daughter's birth. Both bracelets are amazing quality and the engraving is perfect. I'm pretty sure they only come in a 'one size fits all' but I guess that's fine as the bracelet isn't a fully closed circle, so it's adjustable in a way. Since I was so attached and missed my name necklace that I mentioned earlier, I decided it was only right to create another one. However, since I would already have a necklace and two other bracelets, I decided to make this one for my daughter. Again, this Name Bracelet was made very well and reached my expectations. It even came with two different loops so it was able to fit my daughter's wrist nicely. Overall, I'm very happy with all the pieces I received from Soufeel. Their items are made of 925 Sterling Silver and the prices are extremely reasonable, yet they are amazing quality. I'm sure it's because you're buying directly from the manufacturer, so there are no added costs. In addition to Soufeel's already affordable prices, they were extremely nice enough to provide me with a coupon code for my readers to get $$ off - Use the code GSE10 to get 10% OFF your order. They ship worldwide! Do you have any personalized jewelry?